Read about Karch Kiraly who retired his successful playing career in 2007 and is one of the most famous volleyball players. We introduce the best volleyball players in the world – from the past and present. Charles Kiraly, known as Karch Kiraly or just by his nick name Karch is born November 3, 1960 in Jackson, Michigan, USA. Kiraly is one the most famous volleyball players and the only volleyball player yet to have won an Olympic gold medal in both indoor volleyball and beach volleyball. The Kiraly family has Hungarian heritage. Karch's father László took off Hungary in the aftermath of 1956 Hungarian Revolution. The Kiralys immigrated to the United States and eventually settled in Santa Barbara, California. In 1978 Kiraly led his high school volleyball team at Santa Barbara to an undefeated senior season and was named the state's high school Most Valuable Player (MVP). During his high school years, he also represented the U.S. junior national team. Karch went on to attend University of California Los Angeles (UCLA) and graduated with a B.S. in biochemistry in 1983. At UCLA Kiraly led the Bruins to three national titles - in years 1979, 1981 and 1982. He also made his first appearance for the U.S. senior national team during his years at UCLA. Team USA won Olympic gold medals in 1984 and 1988 with Kiraly. Already then Kiraly become the legend all over the world and his status among the famous volleyball players was set in stone. He was a team captain for the 1988 Seoul Olympics in South Korea. Kiraly was named by FIVB, the international governing body, as the best volleyball player in the world in 1986 and 1988. Later in his career Kiraly was also named 'Greatest Volleyball Player of the Century' by FIVB. After the second Olympic gold medal, Kiraly played professional volleyball for Italian volleyball club Il Messaggero of Ravenna from 1990 to 1992. He won the World Club Championship with Il Messaggero in 1991 and was named MVP. After the club volleyball in Italy, he retired from the indoor volleyball and returned to the United States to play beach volleyball full-time. Kiraly won a record 148 professional beach volleyball tournaments. 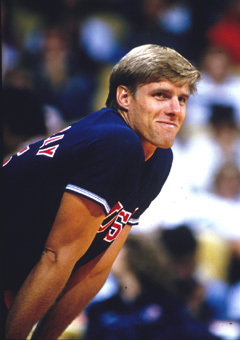 Karch partnered with Kent Steffes to win the first men's Olympic beach volleyball gold medal at Atlanta in 1996. 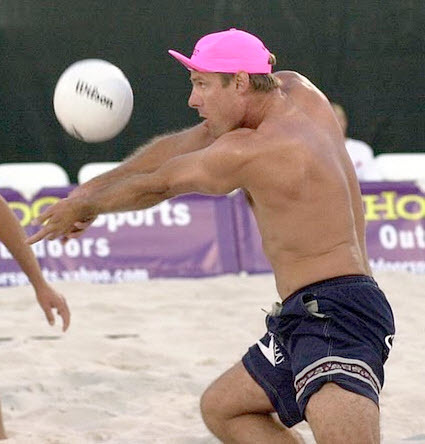 His last beach volleyball tournament win came in August 2005, when he won an AVP tournament in Huntington Beach, California at the age of 44 with his partner Mike Lambert. Volleyball Hall of Fame, which is a tribute to the famous volleyball players, inducted Karch Kiraly in 2001: "Kiraly is known for his overall volleyball skill and his laser-like concentration. He plays volleyball with a hard driven intensity. His competition is fierce but not mean, his ability to shut the world out, legendary. He has an uncanny ability to make the impossible plays and to turn a match around." (Source: volleyball hall of fame). You really can't describe him any better than that. Karch Kiraly is a true volleyball legend, who retired his career in 2007. Height: 189 cm - 6' 2"
Family Status: wife Janna and two sons, Kristian and Kory. Beach Volleyball Partners: Mike Lambert, Kevin Wong, Adam Johnson, Kent Steffes, Randy Stoklos, Sinjin Smith etc. Nicknames: Karch, "Thunderball in Volleyball"
Read about fearless offensive player with spectacular spiking skills.